Register Now ! Get contacts of 24 Profiles absolutely Free, Yearly. Also receive interests from our registered and verified members. Get in touch with your nearest franchise. We also need Business Partners / Mediators, who could help People get Married. JeevanMeet.com has a vast Franchise Network and is expanding consistently. Franchises are located in metros as well as small towns for the convenience of customers. As the Profiles are uploaded through Franchise most of the profiles are verified. Franchise owner gives personal attention and advice regarding marriage proposals. Pre-Marriage and Post-Marriage counseling facility also available. 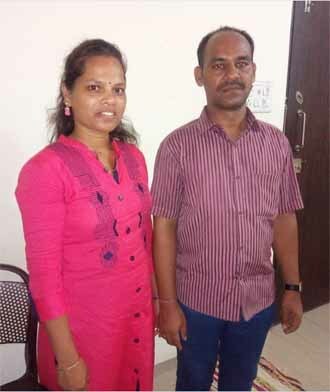 I Sunita Bhayde and my Husband Naresh Kadam Both are Thankful to Pratibha Satere Madam, Badlapur (Thane) Franchise of JeevanMeet.com. Sunita Bhayde who Lives in Mahim, Mumbai but basically from Shrivardhan, Alibag. Naresh Kadam Lives in Kalyan, Thane and is from Mahad, Raigad. JeevanMeet is Web based matrimonial service provider serving Indian market from year 2010. Our vision is to make marriage search a easy and effortless process through our franchise network which can help finding life partner and get people married by working as proper mediator. The mission of JeevanMeet.com is to give a friendly atmosphere to the parents who are looking for in law for there loved one.